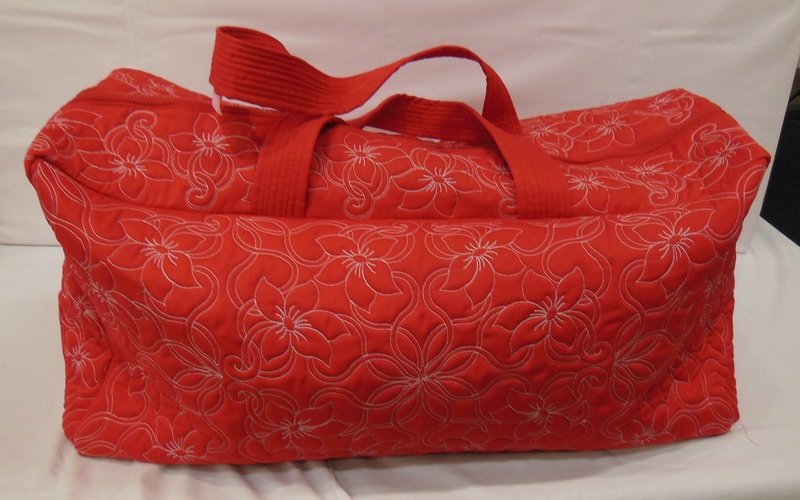 This quilted tote is the perfect size for carrying three quilts! It is big! For this tote, I used a heavy poplin fabric for both top and backing and a stiff batting for the filler. The thread is quite heavy – a 1o weight thread in white that gives a very strong colour contrast and a thick relief effect on the quilted tote. 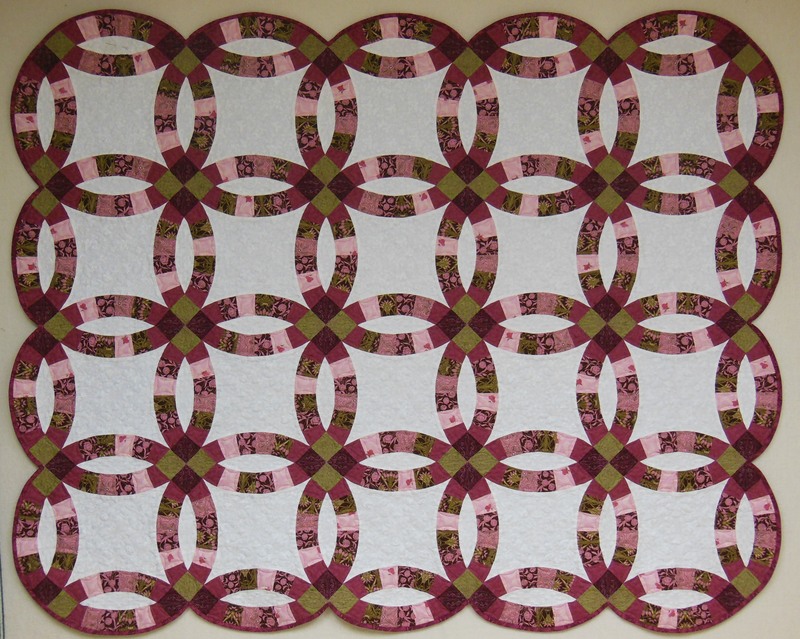 The quilting designs are “Forget Me Not” by Donna Klienke of One Song Needle Arts. I love her patterns because they tend to be consistently dense, giving an allover texture to the fabric surface. I like this bag so much that I intend to make a few more in smaller sizes. It was displayed at the Waterloo County Quilt show last week and several people told me they had quilt bag envy! The president of the guild asked me to teach a class on it. I just might do that! 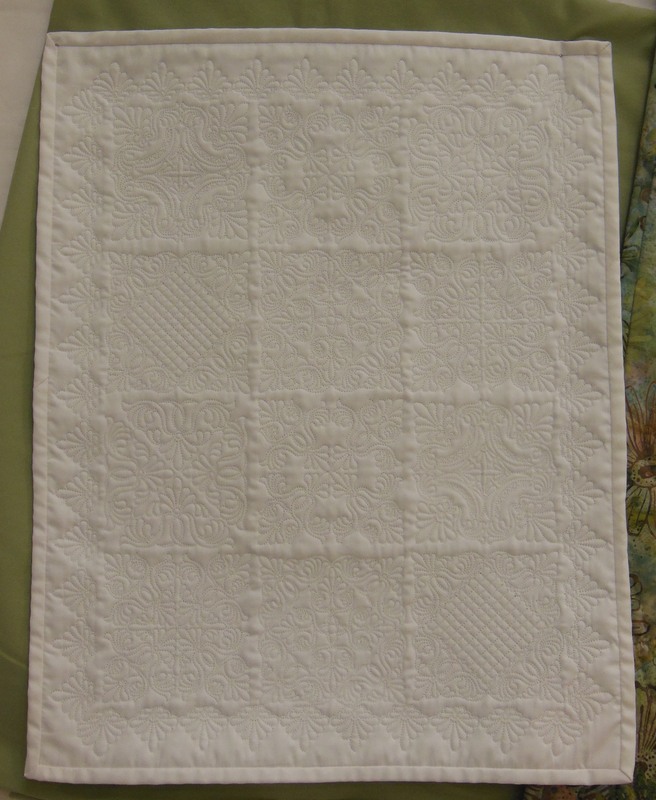 This doll sized quilt is made to resemble a traditional whitework wholecloth quilt. The designs are Barbara’s Feather’s by Donna Klienke of One Song Needle Arts. 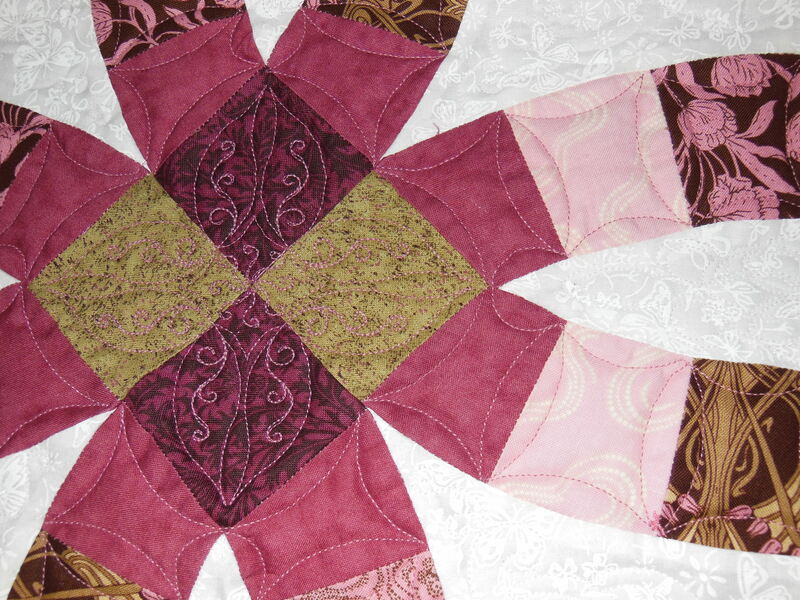 It is quilted with a very fine thread called Bottom Line both on top and in the bobbin. It was fun to make! Maybe someday I will have a granddaughter to whom I can give this little delight! 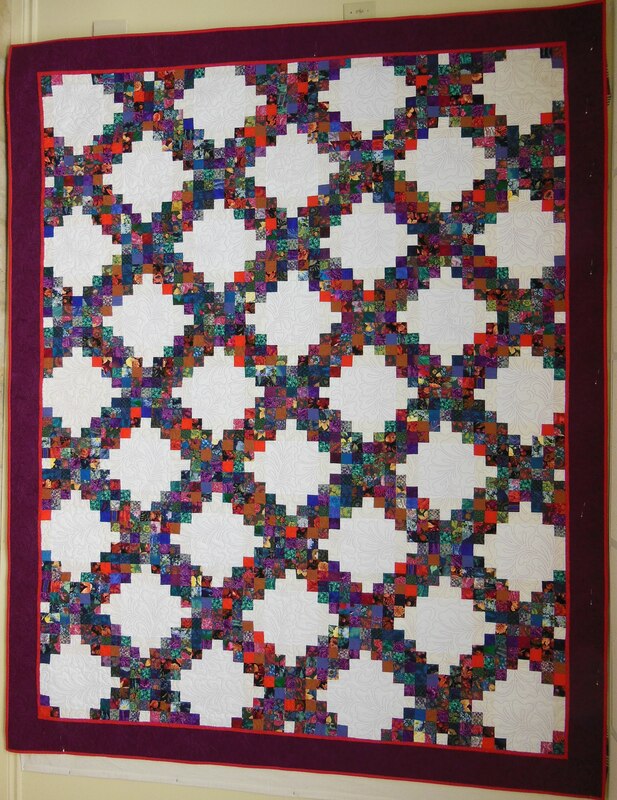 This scrappy Triple Irish Chain was a quilt rescue project. Someone gave me a package of partially completed blocks and many 2.5″ strips. I added strips and more plain fabric to finish up the quilt top. Then to pick up the predominantly red/blue/purple scraps, I selected a narrow inner red border, a wider red-violet border and finally bound it in red. The backing is a purple leaf pattern. It makes quite a dramatic quilt! 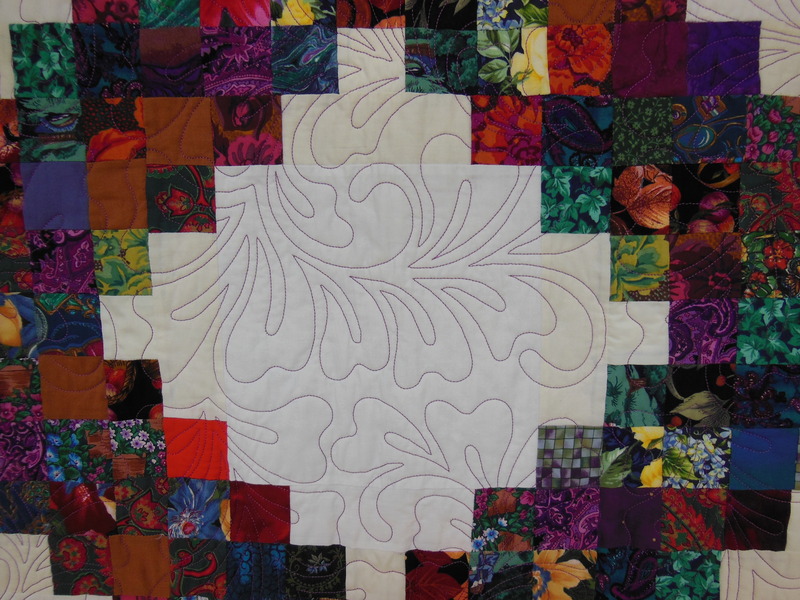 The edge to edge quilting pattern is Seaweed by Anne Bright. I used a red-violet trilobal polyester thread called Magnifico by Superior Threads. The thread has a lovely sheen to it. Because the whites of the background are not all identical (quilt rescue substitution! ), I felt that an all over pattern in a strong colour thread would help to blend the whites. 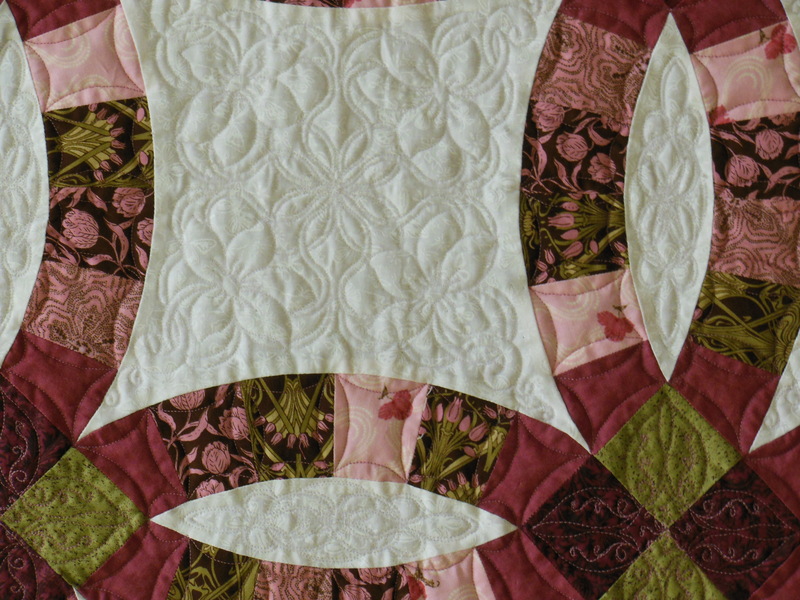 At first, I worried that the different whites would be too distractting and briefly considered giving the whole top a colour bath in dye, but Maureen, my quilting inspiration, tells me the different whites simply add to the charm of the quilt. I’ve decided to believe her!